I remembered when I was little (I’m 32 now) my best friend Heather would come over a lot and we played with Barbies. It was so much fun! I think I had every Barbie made back then. Here is your chance to win a Barbie Glam Vacation House for that special little girl in your life! 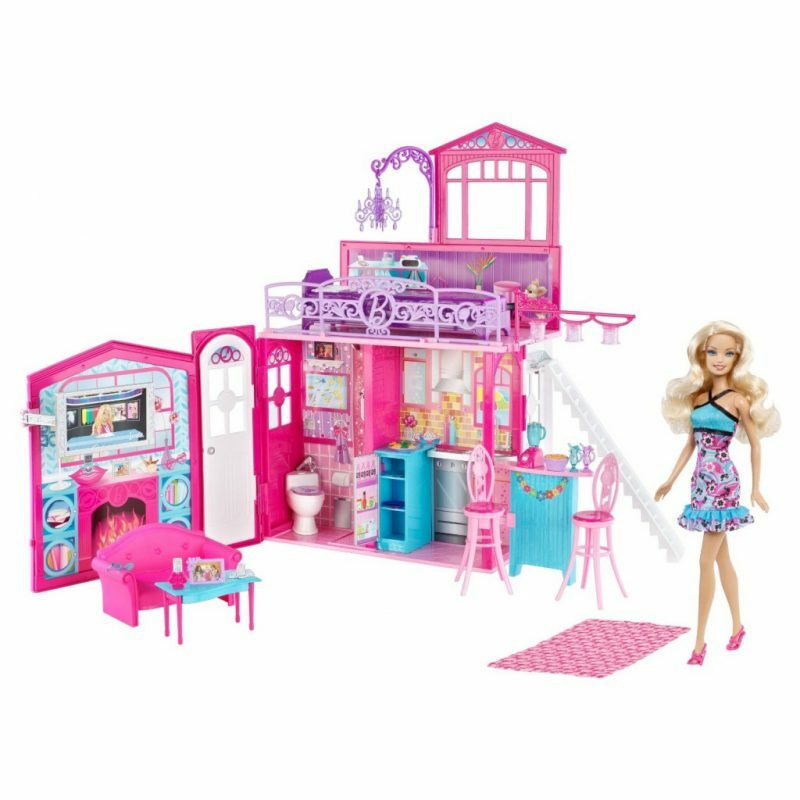 Your Barbie girl will surely love the Barbie Glam Vacation House ! Giveaway ends August 4th at 11:59pm EST, open to US residents, ages 18+. To enter please use the Rafflecopter form below. Good luck! By the time I got done styling my Barbies, I no longer wanted to play with them. Barbie has always been one of my favorites and I am sharing that now with my sister :)who is 8! i played barbies with my friends but never really owned any. i was a tomboy. I play Barbie dolls with my little girl. I don’t get to spend as much time with her as I’d like and she always wnts me to play with her Barbie dolls. I just play anything she wants to play. I still have all my hand made barbie clothes. I don’t let any one play with them. I still make barbie clothes, but don’t voluntarily play with them. I have a lot of “Barbie” moments but one of my “Barbie” nightmares was when my brothers would take her head off…I was traumatized!!! Barbie was before my time, but when they came out I certainly loved them. bought them for all my daughters (5) and each one would just tear their heads off and throw them in the toybox. They preferred their baby dolls. Well, now I have granddaughters (3) and they each love Barbie. Each one has started or has had started for them their own Barbie collection. They want a Barbie dollhouse and a Barbie car – so I have jumped at the chance to win this great prize. I didn’t really play with barbies, but they always had fashion shows! I loved Barbie growing up and now I get to play with them with my daughter. As a child, I spent so much time playing with my Barbie’s. My Grandmother and Aunt had sewed clothing for my dolls, they even had fur coats. My Dad & Brother had built a special cabinet for me to keep my dolls and their clothing in. These items meant so much to me as a child. I do still like Barbie. I secretly wish I was her. My daughter LOVES playing with her Barbies and my old one’s, too. I was always disappointed that my mother would not allow me to get a Ken doll, to be Barbie’s husband. She thought it would encourage sexual immorality. (*:*) Yikes! Glad I wasn’t that uptight with my girls! I still love Barbie. I remember one of my favorite was Peaches N Cream Barbie. Growing up with 9 other brothers and sisters, financially things were pretty tough. But I remember getting a pretty plain jane Barbie when I was 8, it was the most wonderful thing in the world to me that christmas. i remember when i was little i was being babysat and we were playing barbies then we decided to make muffins so we made the muffins but them in the oven and then while we waited we continued to play babies. well all of a sudden in the middle of barbies the smoke alarm goes off and the muffins were on fire! :P lol my babysitter was so scared but for some reason i was laughing hysterically i thought it was so funny watching her dance around the kitchen trying to put the fire out and get the smoke outta the kitchen. i remember this so vividly like it was yesterday, so now when i think of playing with barbies that the story i think of. I used to use the little white plastic things that kept the cardboard box off pizzas as little side tables for my barbies! I remember making doll furniture with my Mom. We used paper towel roll, milk cartons, and other things around the house to make chairs, beds, tables. I still love Barbie (i’m 54) My girls got to use my barbies and then add new items and dolls to the collection, now my granddaughter gets to play with all of it when she comes to visit. I love Barbie and I gave mine to my daughter so I still get to play with them! I use to cut 90% of all my barbies hair! I only had a couple of barbies when I was growing up, we could not afford them. But my daughter had so many. One of the things I remember about the barbie is that my son had a contest at school that the had to use a banana, we took one of my daughter’s barbies that she had torn apart and we made a banana barbie, he won the contest, I have pictures of it. I still love Barbie and have been a collector for years. I remember my sister and I playing with our Barbies on rainy days We would spend the entire day making up different scenarios. Sometimes my brothers would join in with their GI Joes. Now I get to pass my dolls down to my daughter when she is old enough. Can’t wait to play Barbie’s again! If I could I would still play with Barbie but I was blessed with a boy. I play with my daughter that just started to play with them..fun times! Love having a girl. My favorite moment was opening up the Crystal Barbie on my birthday. She had a shiny, pearl-colored dress and “glass” slippers with glitter inside them. Just beautiful. my mom use to make beautiful clothes for our barbies…..i still have my barbies from years ago! I still love Barbie and my grandchildren and I would love to win this so when we play with our collection of Barbie’s we could have even more fun. Thanks to all for the chance to win this great prize. I loved playing with Barbie as a little girl. I can’t wait to share her with my daughter. I grew up in a house with 8 siblings. Christmas was OK but pretty small scale. I never had a Barbie until I was TWELVE…my Godmother gave it to me for Christmas and by then was so out of dolls. But because of this, I loved to gift my four girls lots of Barbies and the sets, cars, etc. We had a LOT of pink and purple plastic in our house! I only wish I had all the cute shoes Barbie gets to wear. Brat! LOL! Who does still love Barbie? Gad me daughter is getting not them. My favorite Barbie I ever had was Ballerina Barbie. I still love barbie, it’s nice to get a few memories watching my 2 daughters play. Barbies was always my favorite to play. Thank you for the chance! I remember playing Barbi’s with my friends well into my teens. We use to pretend they were lawyers. Barbie was my favorite toy as a child. I used to play with Barbies as a child and I still like them. I use to have tons of barbies as a little girl, now I still have a few I collect, but I buy doubles for when my daughter gets more into them. I still love barbie but my daughter who is seven is a mojor fan i try to get her alot but i mostly hit the second hand stores because i am a single parent and i only have the one job which seems to pay the bills and not much else so this would be a perfect b-day gift for her eighth bday coming up. i still love barbie and when i was little i had barbie mcdonalds hot tub drop top car everything. Facebook grouping 2 has one that says can not be seen by current user. When my now 17 year old niece was little, I gave her my old Barbies to play with … but I kept all my favorites! I have the Wizard of Oz collection of Barbies still in the box because my family loves that movie as well. I still love Barbie and always will, one of my best memories was when I was 7 at Christmas I got the Barbie Townhouse and the Barbie Jeep I thought I was a rich kid. I loved playing my with my barbies. Now my daughter enjoys them as well and I will play along with her. I absolutely not so secretly love Barbie! I remember trying to cut my Barbie’s hair into a bob, but it didn’t work out. It got way too short and stood straight up on her head. I renamed her Spike. I do still love Barbie! I love that something that was so great in my childhood is now a big thing in my daughter’s! Nothing better! I never played with Barbies, but my sisters did all the time. My first Barbie doll was given to me as a Christmas gift, when I was a pre-teen. I grew up playing with my cousins – we were blessed to have the wicker furniture and refrigerator! I would spend hours and hours playing with Barbie dolls when I was a little girl and now my daughter does the same. our daughter has a Barbie and loves her. She is a classic that will never die! I still love Barbie and play with my niece. WONDERFUL Post.thanks for share..more plz..